Age 12 finds many of us in the midst of an awkward phase, suspended somewhere between kid and teenager. If your preteen years occurred in the early 2000s, perhaps it was a phase of clumsily applied eyeliner and emo boy bands. Or maybe High School Musical was the soundtrack to your middle school years. 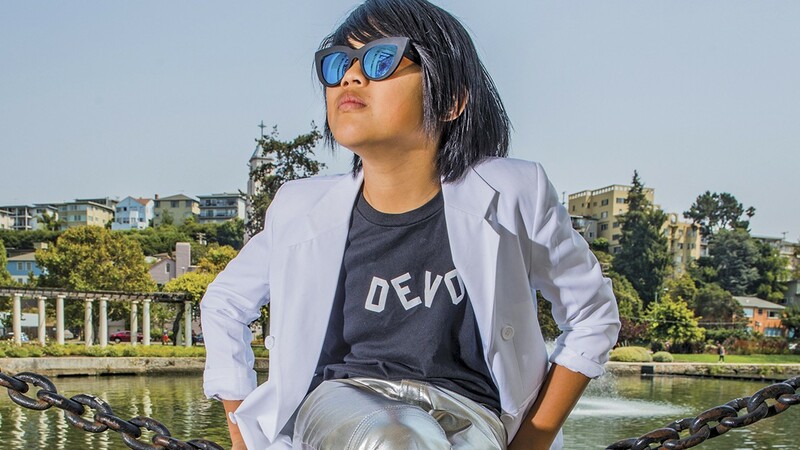 But for Francis Lau, 12 years old finds him somewhere impossibly cool: sharing a stage with Devo. While other kids his age were still cranking Kidz Bop, Francis was discovering his love for '70s and '80s new wave music. His father, Edward Lau, introduced him to Devo, Kraftwerk, and Depeche Mode at age 9. When he started to worry Francis would get bored of the classical piano lessons he was taking, Edward thought of the bands he listened to in college — fun, contemporary keyboard-centric music — and shared them with his son. Francis was an instant fan. The young musician started taking piano lessons at a rock school in Oakland called Bandworks, but quit after a few weeks — the instructors insisted on teaching the guitar-heavy bands like AC/DC and the White Stripes over Devo. "I asked if we could do Devo and they said that wasn't rock music," said Francis. "I kind of thought that was a joke, but it was serious." But soon after, the Laus stumbled upon the perfect fit for Francis: Three O'Clock Rock, the after-school rock music program. The connection was immediate, as Francis's teacher, Billy Ribak, shared his love for Devo. Ribak even helped Francis make a psychedelic music video for Devo's "Time Out for Fun," which went viral within days. Now, Francis plays in a band called the Double Helix at Three O'Clock Rock, as well as his solo endeavor, the Francis Lau Experience. Earlier this summer, he became the youngest musician to perform at Burger Boogaloo, where he got to meet the members of Devo. Live, Francis commands the stage with a confidence quite impressive for someone his age. He bounces around with infectious energy, tossing his long bangs out of his eyes, fist pumping, and singing into a headset while commanding the keys of a Roland synthesizer. Off stage, he's not shy, either. At the Three O'Clock Rock rehearsal space located in the Oakland Chinatown building where he lives with his family, Francis reflected on playing solo versus with his bandmates. "The pros of playing by myself are that I kind of get all the credit. The cons are you have to put everything on a track and it sounds really mechanical," he explained. Francis played solo at Burger Boogaloo, but a few weeks after, he was on stage with a member of Devo himself. The last weekend of July, he travelled to Cleveland, Ohio for the annual DEVOtional convention, where he and his Double Helix bandmate played a set of songs with Devo bassist and co-founder Jerry Casale. They even rehearsed together beforehand in the aforementioned Three O'Clock Rock space in Chinatown. "Jerry was sitting right there," said Edward, proudly showing a video of his son practicing nonchalantly with the Devo superstar. It's all Devo for Francis right now, but he writes original music, too. One song he learned to produce using Ableton is a synthy instrumental piece, which he says was inspired by walking home from school and hearing people turn the bass up really high in their cars. "I tried to mimic a car shaking," he said. Francis says he'd love to make an album one day, but like any child prodigy, he's not singularly talented. He's just as good at school as he is at whipping out a sick synth solo. Currently enrolled in math classes at the College of Alameda, he hopes to keep studying math and physics while doing music on the side. According to his calculations, he's already on track to start college at age 16.